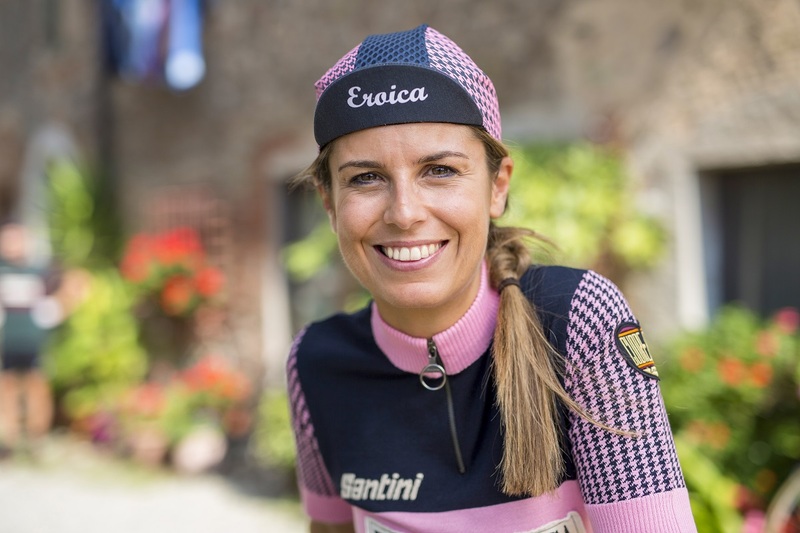 Santini’s 2018 Eroica collection is an authentic line of vintage cycling clothing for men and women who, in the spirit of cycling’s pioneers, inspire to ride their own heroic adventure. We’ve all seen the iconic photography of the greats of cycling’s early days. Black and white images of whip-thin riders on bikes that weighed three times what a modern bicycle does. Riders in baggy wool clothing and goggles who carried tires like bandoliers across their chest and drank water from corked aluminum bottles. Riders who had to shift gears users levers on the down tube or, if you go back far enough, had only one, fixed gear. They fought over primitive mountain passes, in all kinds of weather, in heroic performances that still motivate cyclists today. Such riders were the inspiration behind L’Eroica, the epic, vintage-cycling-inspired event held each year in Gaiole, Chianti Italy. The Italian world Eroica means Heroic. L’Eroica means The Heroic, and refers to an annual cycling event in Gaiole, Italy where cyclists pay respect to the heroic performance of cycling’s early sporting pioneers by riding long distances on rural Tuscan roads using only vintage (pre 1987 by strict rule) equipment and clothing. Since its inception in 1997, Eroica has grown more and more popular among cyclists who want to and connect to the authentic roots of the sport. As well as the original event in Gaiole, Italy, there are now Eroica events in Spain, Japan, the United States, South Africa, and other places where people want to come together to celebrate cycling’s values and traditions. L’Eroica Gaiole takes place On October 7th this year. Drawing on our half-century history making clothes for cyclists in pursuit of their own heroic performances, we collaborate with Eroica to bring you a collection of vintage and vintage-inspired clothing. Our Eroica collection incorporates the textiles and manufacturing processes of cycling’s early eras. You’ll find wool, metal zippers, embroidery, patches, and silk foulards in the collection, as well as options for both for summer and winter riding. The color palette reflects the unique pink Tuscan sunsets, the earthy bordeaux and rich greens of the landscape, and the white Strada Bianchi roads that dominate Tuscan wine country. For men, there are several short-sleeve wool jerseys, a couple of modern kits in vintage looks, and long-sleeve jerseys and jackets in classic materials for winter riding. For women, our POLVERE line offers one jersey in wool with a pink houndstooth print and three jerseys in modern textiles. Ultra-feminine in both color and cut, the COURE woollen jersey is aquamarine and cream with needlecord stripes. The Eroica collection for women includes coordinating accessories. To complete the heroic look for both men and women, we offer retro embroidered woollen Eroica bibs and shorts with a modern, antibacterial padding designed to mimic the look of the original leather chamois. The entire Eroica collection is ‘authorized’ for use in Eroica events and available now at our website, at Eroica events, and at select retailers.